This tape comes to us via Casey Lewis, without the jcard. We managed to steal the artwork from elsewhere on the interweb, saving us from the no jcard tag. But we still don't know much about these guys - the contact on the tape is Mark Vermin, who we think is/was/will ever be Mark from Inquisition/Martyr Index. But we're a bit damaged after Sled Island. We're not sure about much right now. Didn't even know this came with artwork, mine just was a red tape in a blank case. Pretty great band from the late 90's, wasn't there like 8 members?? 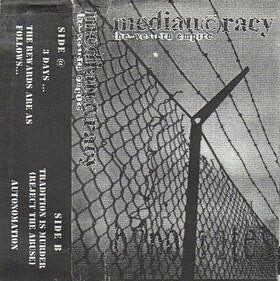 There were definitely a number of members over the fairly short time Mediaucracy was around. I think there were 6 when this was recorded. I joined them on bass after this record was made and through that last period we were a 4 piece. They had two singers, one was Mark Bizek the other was Zach Worton, who has sine gone on to become a great comic book artist. his new graphic novel is called "Klondike" and it's out on Drawn and Quarterly from Montreal. he works at the comic book store i frequent in Toronto.